Though it is generally believed that money is the main priority for employees, in today’s time, it is not that true, research and studies have enough proof. In fact, Monster.com did a survey in 2010, according to which, around 87% of employees said what mattered most was “A caring employer”. Good compensation was listed as only the fifth most important factor. This finding has been consistent with many other researches, studies and surveys. One of the reasons why money has moved down the important scale is that, today there is a lot more stress in daily life. People are busier than before in their lifestyle and many often complain of having little or no time for their own self. The economy since the recession of 2008-9 has not been in great shape and jobs growth has been anaemic at best. The last few years have made people value a work place that keeps them happy. Most of us end up spending more than 8 hours in our office. This employee preference towards a more caring employer, friendlier employer has begun to drive employee retention trends almost as much as money. Money has become one of the important factors but it is no longer the dominant factor that it used to be. Energy tends to flow top down. Even scientifically energy flows from higher potential energy levels to lower energy levels. As a senior person in the organisation or as an employer you have the ability to do drive positive energy. Positive energy is contagious and usually spreads around if you lead by example. So if you walk in on a Monday morning with an infectious smile, have a “Let’s get this done while having fun” attitude, it lifts the team mood and improves productivity. For any person to be able to punch above her weight usually a combination of various energies is at work; spiritual, emotional along with physical energy. For example media, advertising, designers, developers among others are creative people who solve problems, drive innovation and ideas. For them to deliver their best work, the office needn’t just be about rules, processes, compliance and the works. To liberate the multi-dimensional energies in a person, it is important for you as a leader, be able to judge their current state and appropriately adjust your response and motivation approach. It is not necessary that you be inquisitive about their personal life, but as a leader you should be able to tap into these three energy levels to make the working environment a much more comfortable and happier place to work. Any organization, irrespective of size, is nothing without people. Without them, no company can survive. Hence, leaders that drive policy making should keep employees at the heart of everything that they do. Share success with the employees, and if there is a failure, don’t pin blames but face it as a team. That’s the sign of great leaders. Think of creative ways on how you can focus on your employees more. As a leader, you expect integrity from your employees but do you have that in you? As a leader nothing works better than leading by example. If you are driving policies or changes that tend to bring errant employees in line, nothing works better than applying those changes to yourself and let everyone know that the rules are the same for everyone. Any motivation to anyone starts with great communication. Great communication skills are important attribute for a leader who wishes to inspire his employees. Rarely has a leader in history been successful without communication skills. Whether it is to communicate good news or bad, communication is package that delivers motivation, employee engagement, organisation vision and values and makes the employee find their own anchors and hooks with the organisation. Creating long term employee retention hinges on how communication is managed in every aspect of the organisations interaction with the employees. Good communication skills aren’t just about speaking but it is also about listening. Listening keenly means you not only understand the words that your employee is speaking but you also know what he means by them and read between the lines. That’s the attribute of a great leader. An employee will value his work place more if he realises that his employer is keen to listen to him provides a lost of assurance for a longer stint at the employer. Problems! Problems! These are the ones that create obstacles everywhere. Train your employees in solving problems. Assure them that you will guide and support them in that process. Solving problems successfully helps build employee confidence. Couple this with the instances where you chipped in to help solve their problems or provided direction that resulted in a successful resolution. Let the employee take the credit for that and she will respect you a whole lot more. If employees feel they have the freedom to go and solve problems and can rely on you to back them up, it makes the workplace a far more fun place. When you view your employees as partners, they see the company with a sense of ownership and their efforts to see through things are commensurate with their degree of ownership. If you just build a boss- subordinate relationship by bossing them around it ends up creating a stifling atmosphere it drives out employees in the long run. No matter how well a person might be paid, if there is no progress in the job, she will not be happy. A large majority of employees need to see regular opportunities to advance their career goals rather than just a lot of money. This could be done in the form of independent assignments on new areas, getting them to learn new skills or adding new responsibilities to their portfolio. Try to find how you can juice up their daily professional life by constantly putting them in a zone where they feel they are making progress towards their career goals. In today’s times, it is not just perks or a high salary that most employees attach importance to but it is also knowing that that they will not be fired at any whim and fancy of their manager or some person sitting in an ivory tower. Most employees want a reasonable security in their job. No one expects life time employment these days but layoffs on flimsy grounds without considering alternate options are what bother a lot of people. Leaders that expect respect from their employees need to first learn to respect their employees. Respect for an individual is a basic tenet in any successful leader. Any disrespect shown to an employee during any interaction just creates negative energy that destroys productivity. This does not mean that you don’t have a tough conversation with an employee who put in a bad performance or missed a critical deadline. What it means is that the tough conversation is not disrespectful to the individual. The employee should not come out of that meeting feeling that she was insulted or disrespected, irrespective of the tough message. No matter what money is on offer, if the work becomes a routine, no employee will feel motivated to work. As a leader, setting challenges for your team helps. It helps make work less of a routine. Include different tasks and inspire employees to take up “Stretch tasks” test their skills. But at the same time, assure them, that you will be there to help out even if they struggle to push their limits. Constant learning is rather important in many fields to keep abreast with the latest developments in many fields. Holding workshops or seminars or having employees go to attend these are easy and simple ways for employees to gain new perspectives, get ideas to do better at work and also prepare them for challenges. These days many internet platforms like meetups offer many informal gatherings of like-minded people to get together and have fun. Be it criticism, discontent, disagreement, appreciation, or gratitude, create an atmosphere where employees will not hesitate to express their opinion openly but politely and professionally. The key here is to encourage dialogue within employees and with their superiors and bosses. If employees are confident enough to share these views openly, it is always easier for the organization to be handle these concerns instead of letting them fester and turn into employee attrition at a later date. A word of praise, a note of approval or a gesture of congratulation, all these are small gestures that go a long way in building employee motivation. A word of praise, especially, given publicly, not only enhances the self-worth of the employee, he also becomes grateful for his boss in acknowledging his efforts in front of his colleagues. A leader is one who prides in being a member of the team than being a team leader. When an employee sees his boss often saying things like ‘I did it’, ‘My company’, ‘I want to do this’, etc., she will feel very loosely aligned with the goals of the team. But if you say, ‘let us do this together’, or ‘our company’, the employee will feel that she is a part of the company and is not just working for it. 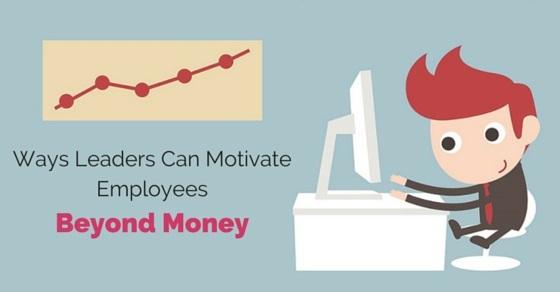 These small gestures help a lot in motivating employees beyond money. Know the strengths of each of your employees and encourage them to take projects that allow them to develop their own leadership skills and highlight these strengths. These leadership skills could related to technical leadership or people leadership but it pushes them to newer areas in their own way. This gives them a chance to meet higher expectations and achievements in the future. What is your goal as a leader? Whatever it is, involve your employees too in it, be it getting the most prized contracts or increasing the production. Initiate an idea-sharing platform with the employees, and ask their suggestion on how to go about to get the contract. Similarly, be a part of their professional and personal goals in life without being too nosy about it. Don’t wait for Christmas or any other festive occasion to throw a party or get people together and have a good time. You can have a Monday morning hot-dog huddle or Friday evening beers to just unwind and interact people outside of work. Go for a picnic or an out of office activity with employees once every few months. You can even have fun company events that are a mix of work and pleasure. In times of recession and economic crisis, when employees are usually worried about their future employers have to go out of their way to retain good employees and keep them inspired and focused and be more productive. Even employees prefer working in an organization that acknowledges their hard work, and helps them in their professional growth. I hope that these different ways will help leaders keep employees motivated and energised, so that they can drive long term engagement and productivity with their teams.